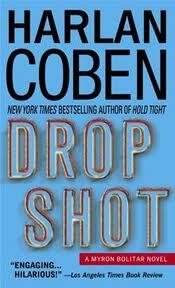 My Series Sunday pick is Drop Shot, the second book in the Myron Bolitar series by Harlan Coben. Valerie Simpson is a young female tennis star who wants to make a comeback. She feels Myron is just the person to represent her. Then, she is murdered in broad daylight at the U.S. Open where Myron's hottest new male tennis star client, Duane Richwood, is playing. So why is he number one suspect? In true Myron fashion, he dips his nose into the investigation. As he pries further into the past, the truth becomes dangerous. I. Am. Still. Hooked. Drop Shot is another page-turner that had me laughing at the witty dialogue and gripping the corners of my NOOKcolor at the plot twists.